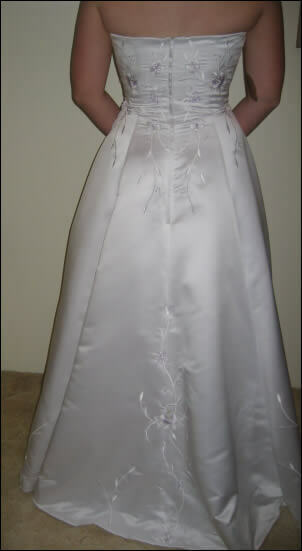 "Peter Trends" Brand strapless wedding dress - fully lined with tulle layers under. Swarovski crystal & beaded Chiffon overlay rouched into the left side of garment. 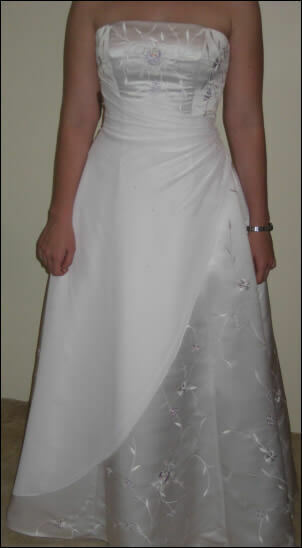 The dress is boned & fitted at the bodice- Embroided with White & Lilac threads. The dress has a slight embroided train. It was purchased in July this year for $1900. I can include a small tiara if you wish. I also have a matching flower girl dress size 6.